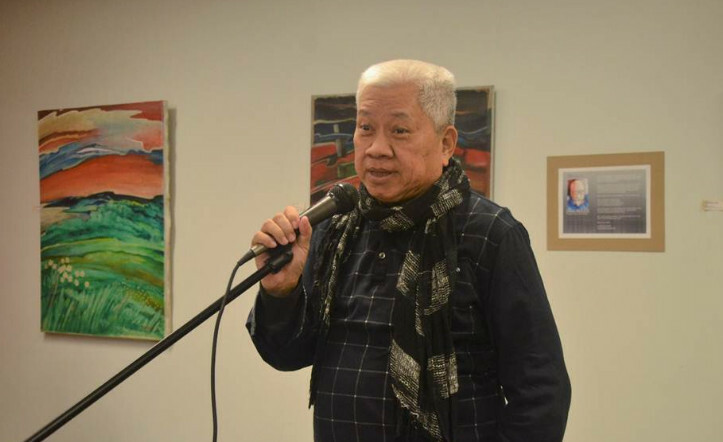 The Philippine Consulate General in Calgary held a soft opening ceremony featuring an exhibition of the paintings by Mr. Heber Bartolome and a reading of poems about some of them on October 29. The event was attended by some 70 community leaders and members of various civic organizations who were also given a tour of the office. Mr. Bartolome, while better known for his music, is also an accomplished painter and writer. Citations for his artwork include those from the 1983 Mini-Print Exhibitions in Spain organized by Salvador Dali, the First International Biennial for Print Competition in China in 1982, and at the XII Grand Prix Internationale d’Art Contemporain de Monte Carlo in 1978. His credentials as a writer include being a former Professor of Philippine Studies at the De La Salle University (DLSU), author of a DLSU Filipino textbook, and member of the UP Writers Club, the Kapisanang Panitikang Pilipino, and the Unyon ng mga Manunulat na Pilipino (UMPIL). Mr. Bartolome exhibited 32 of his artworks in various media which were displayed throughout the Consulate. Guests representing the different Filipino community organizations in Calgary were very appreciative of the artist’s talent as they viewed his work. The program also included a reading of poems selected by the artist. The poems were: “Sampayan” by Rio Alma, read by Ms. Dolly Castillo; “Sinampay” by Bien Lumbera, read by Mr. Eric Evano; “Sampayan” by Jose Lacaba, read by Consul General Julius D. Torres; “Reta-Retaso by Krip Yuson, read by Ms. Maricar Dilan; and the artist’s own “Daptihapon,” read by Ms. Chit Munar. The readers were chosen by the artist – a Fine Arts Graduate from the University of the Philippines – from among the members of the UP Alumni Association in Calgary. Upon request of the guests, Mr. Bartolome also performed some of his most popular songs. His artwork will remain on exhibit at the Consulate until the first week of December.